A view across Clear Lake taken this morning. The fish are jumping like crazy. Either they are having a feeding frenzy - or trying to keep from being a meal! A private suborbital spaceship built for the space tourism firm Virgin Galactic made its first flight with a crew onboard Thursday as it soared over California 's Mojave Desert beneath its enormous mothership. The commercial spaceliner – called VSS Enterprise, one of the company's fleet of SpaceShipTwo spacecraft – did not try to reach space in the test flight. Instead, it stayed firmly attached to its WhiteKnightTwo VMS Eve mothership. The two crewmembers riding onboard VSS Enterprise evaluated all of the spacecraft's systems and functions during the 6-hour, 12-minute flight, Virgin Galactic officials said in a statement. In addition, automated sensors and ground crews conducted thorough vehicle systems tests. "Objectives achieved," Virgin Galactic officials said in a statement on the company's website. "Congratulations to the whole team!" Three other crewmembers flew aboard the Eve mothership, which is designed to carry SpaceShipTwo to an altitude above 50,000 feet (15,240 meters) before the spacecraft drops and fires its hybrid rocket motor to launch into suborbital space. Virgin Galactic was founded by British billionaire Sir Richard Branson. The SpaceShipTwo spacecraft and their WhiteKnightTwo motherships are built for Virgin Galactic by Mojave, Calif.-based Scaled Composites, which was founded by veteran aerospace designer Burt Rutan. SpaceShipTwo is built to carry eight people (six passengers and two pilots) on suborbital flights that would reach outer space for a few minutes, though would not go high enough to enter Earth orbit. The flights will provide a weightless experience and a view of the blackness of space and glowing Earth below. Tickets cost $200,000 per person. Rutan and Scaled Composites also built SpaceShipTwo's predecessor, the smaller suborbital craft SpaceShipOne financed by Microsoft co-founder Paul Allen, which won the $10 million Ansari X Prize for reusable, manned suborbital spacecraft in 2004. Thursday's captive flight test was the 33rd voyage of the mothership VMS Eve, one of company's the WhiteKnightTwo craft. It was the third captive-carry flight for VSS Enterprise. The first of these joint flights occurred earlier this year in March. The mothership crew consisted of Mark Stucky, Peter Kalogiannis and Brian Maisler, while Peter Siebold and Michael Alsbury rode aboard VSS Enterprise. The VSS Enterprise is the first in a planned fleet of suborbital SpaceShipTwo spacecraft for Virgin Galactic. While the first test flights are being flown from Mojave, Calif. , Virgin Galactic is building a terminal for space tourism flights at Spaceport America in New Mexico as well. The VSS Enterprise named after the fictional starship of the same name from the science fiction television franchise "Star Trek." Copyright © 2010 TechMediaNetwork All rights reserved. So....you still think only NASA can take people to space? After SpaceShipTwo, they have plans for a SpaceShipThree - to go into orbit....I'm betting Virgin beats NASA back into space. 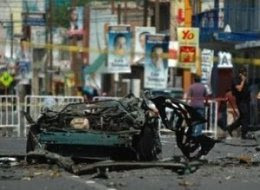 Drug gangs in Mexico for the first time used a car bomb. It won't be the last time. Ironically, my original script I was writing when the Gulf War started was about an international collaboration between South American drug gangs and a Mideast plot for a terror attack on the U.S. It seems that the drug gangs are now taking a page from the Middle East violence - using a cell phone to set off a car bomb at the worst possible moment. This incident is a bad omen. It means that there will be more of these as the fight between the wealthy gangs and the government of Mexico continues - with the gangs with far greater intelligence, arms and money than the government. There is a Newsweek article that suggest legalizing pot could hurt the cartels (remember Al Capone in the 1930's? Legalizing booze put him out of business, along with his failure to pay income taxes). So why not take it out of the cartels inventory and cut their profits 20-50% (the estimate profit they make from selling it)? TAX IT. Use it for medical purposes. Strip the cartels of a business and put it in the hands of legitimate business, like the pharmacies they have set up in California, New Mexico, etc. President Nixon started this "Drug War" in the 1970's. It has been a total failure for over 40 years. Insanity is defined as trying the same thing each time and expecting different results. Pumping more and more money and military equipment into the drug war has not made a difference. Putting people into prison for smoking a substance less dangerous than alcohol or tobacco is not making a difference. The gangs are making over $100 billion/YEAR, which they use for importing American high powered weapons from American gun dealers to wage turf wars. Now they are adopting Al Qaida techniques to maintain power. They've even begun assassinating candidates for high office. We have a situation as serious as Iraq right on our border, which stretches from Texas to California. A lot of people think the biggest threat to us is from illegal immigrants. Most of those people are simply looking for work and opportunity they can't get in Mexico. They do jobs I don't see any American willing to do - nasty jobs like picking veggies or working in a meat plant. You want that job? The real threat to us comes from the billionaire drug barons who have a fondness for beheading victims, assassinating political leaders and now -- car bombs. They do it with less concern than Al Capone had for lives of any kind. And they are doing on American soil as well as in Mexico. We need a new course of action. Removing a profit center from the cartels would be a good start. Otherwise they will only continue to grow bigger, more violent and more dangerous. If by removing even one profit center from their world, we cut their profits --that is a good thing. It would also give us tax revenue source we never had and could really use right now. A pot tax would add billions in revenue to the State of California alone. What if these drug lords get bored with buying American machine guns and acquire a nuclear weapon? They are already rich enough to built submarines (one was found recently being prepared in a remote jungle). Losing that sub will hardly dent their finances, or stop them from building more. You can do a lot with a $100 billion tax free dollars a year! We need to take a different approach to win this "war" - or things will get worse. This first car bombing on our border should be a wake up call. An American consul officer was killed with her husband recently. No one is safe on either side of the border. But I suspect that it will take an even worse attack by these thugs for us to change a losing strategy. The Netherlands has coffee shops selling pot and their world did not end. The streets in Amsterdam are less violent than those here in Houston. Alex provided a wild week, with us dealing with rain while doing jobs. Yesterday I saw two major traffic back ups on I 45 as I went North. One car was sideways with its wheels up against the cement median and up against its top was an 18-wheeler. I didn't look good for whoever was in that car. We did a job in Spring yesterday, which was on the receiving end of 5 inches of rain. It was a 2-hour compute to get home, with flooded access roads. The day before the guys had to access a third story window with a 40 foot ladder in the rain (normally the film goes on the inside but these windows weren't accessible from the inside so we had no choice. Just as the rental ladder arrived, so did the rain gusher. It was hair raising but fortunately there was no lightning and no one fell 40 feet getting it done. I was soaked. The calls keep rolling in for Armor Glass, so I bought a small Toshiba notebook computer today to take with me to process work in the field --the bigger Fujitsu laptop was so bulky and heavy to handle in my van. The Toshiba has a 13 inch screen but is light as a feather. I looked at the Ipad first - but it doesn't have a printer hook up or enough memory to do what I needed to have done. It was a wild week of rain due to Alex - even though it was 500 miles away. Another busy week ahead...all the way to August and beyond.